Well, I thought I do some housekeeping on my desk today. If it gets any messier, then the bladdy cleaning Ah Soh will starting tidying up on my behalf and THAT'S when I will start to lose things. As messy as they are right now. I always knew where what was. Every piece of what-nots has got its own place on my desk. I call it the natural state of things. 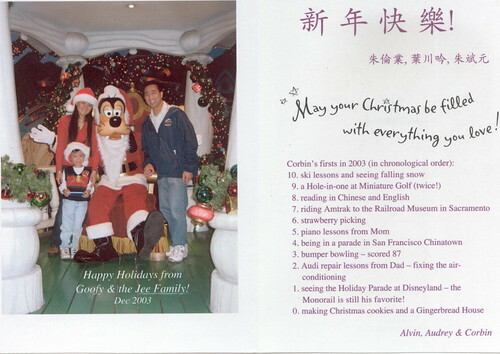 Anyway, as I was clearing out my drawers, I found 2 Christmas cards from my uncle-in-law Alvin and my aunt Audrey with my little cousin Corbin. As old as uncle and aunt may sound, they are actually around my age. It's just that my Grand-Uncle is 3 years older than my dad. Click here to see them during my last visit to Sunnyvale, CA. The one above is from 2003. What I enjoyed reading most is Corbin's Top 10 List. Click picture or here to enlarge. Here's another one from last Christmas. Click picture or here to enlarge. 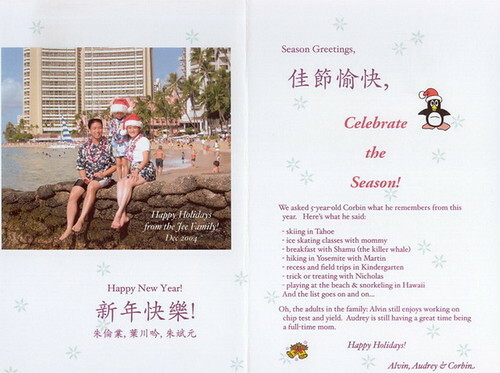 Looking forward to this year's card. at least it's the cleaner ah soh that helps u tidy ur table. my boss likes to come to my table when i'm on leave and will comment about the trivial negatives that he happens to see, like an old woman. This may be off topic but what the hell, it's my blog. Let me tell you about the 2 kopi-sohs in my ex-company. 2 lovely ladies if I may add. I drink only tea in the office coz I drink my coffee with sugar and that means that I need to wash the cup after each coffee. Yes yes, call me an unhygienic slop. Whatever. I used get free breakfast from them for a whole month coz they bought 4-D on my car license plate and struck 2nd, 3rd and 2nd prize in consecutive weeks! Boy, do I miss them. Such a great card concept! I like it. Yeah... the Unlcle Alvin is quite good at these stuff. There was this time Corbin fell on his face and his tongue got snipped off by his teeth. Just dangling there by the edge for dear life. Thank God, for the doctors who managed to re-attach the tongue back.